Happy almost 2015! How were your holidays? Ours flew by but we enjoyed every minute of it. It was fun to start new traditions and combine them with old ones. Kids just make Christmas so much more fun!! After days of being on the go, missed naps, and late bedtimes, I have two crabby and tired little girls. I've been trying to get them back into our routine and pick up the house. The girls were spoiled this year which is resulting in me getting the playroom I've been wanting to store all this stuff!! But that's another post for another day. 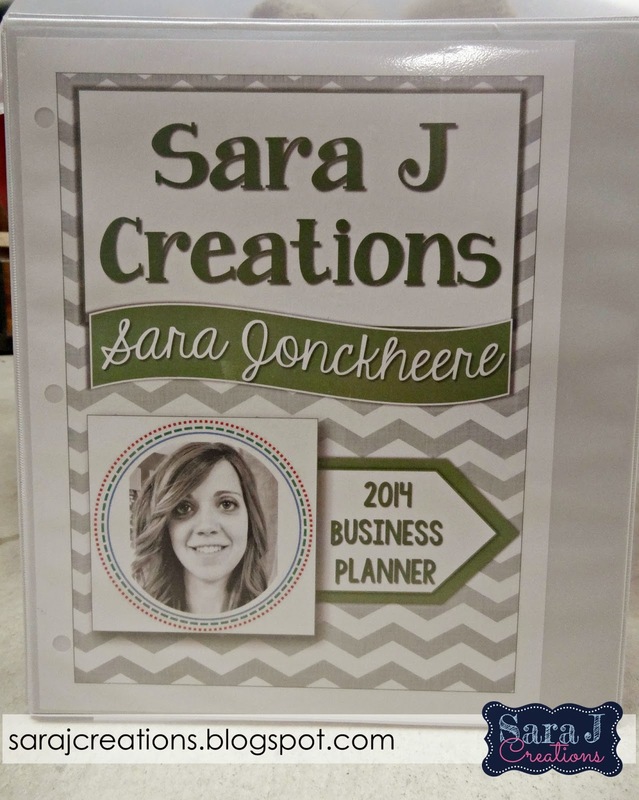 As I was sitting down last night to create some new products it dawned on me that the year was almost over. Like in two days over. What? It snuck up on me and I decided to spend the night getting ready. I liked most of my organization for my TpT store "stuff" that I used last year but I knew I needed to make some changes. I really felt like being more organized this past year really helped my productivity, motivation level and overall success. I think by nature I like to be organized (don't look at my house today as any indication of that) and as a business owner I like statistics, numbers, and the ability to graph and compare where I'm at currently with where I've been. 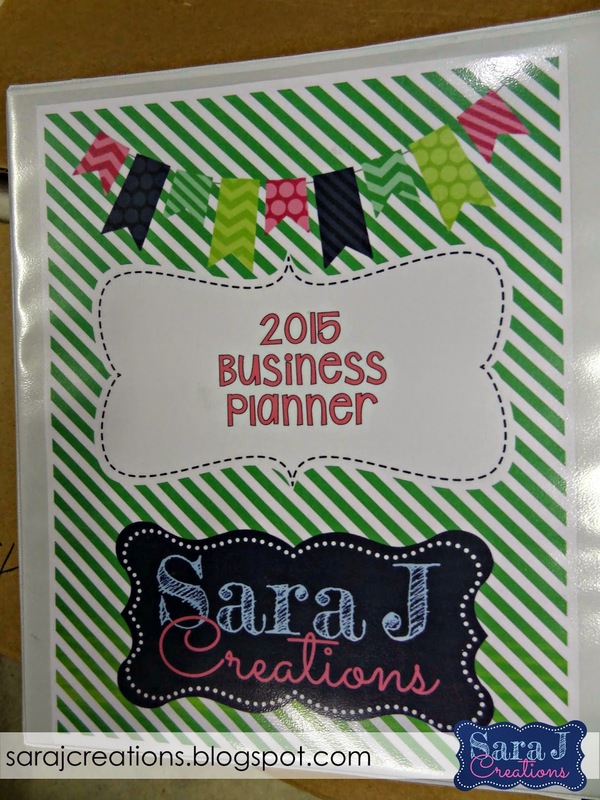 Last summer, Lindsay Perro posted this awesome personalized business planner. It was half price because the year was half over so I took the plunge. She customized it for me and I sent it off to have it professionally printed. 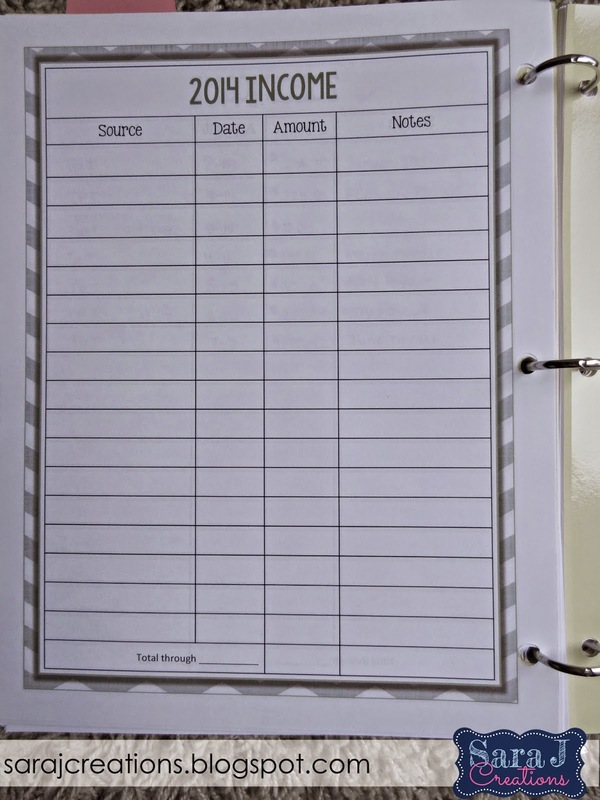 I stored it in a binder and it is always nearby when I'm creating, blogging, and networking. I checked Lindsay's store and I no longer see this product. I'm guessing that it was probably overwhelming to customize that many planners for people. Since I knew it wouldn't be an option to order a new one from her, I started thinking of new options. I super loved THIS planner from the 3am Teacher. It is on sale and it comes with so much. But I started to think...do I really need something in color (even though it is super cute and colors that I love?) Plus, there are pages I probably won't use. 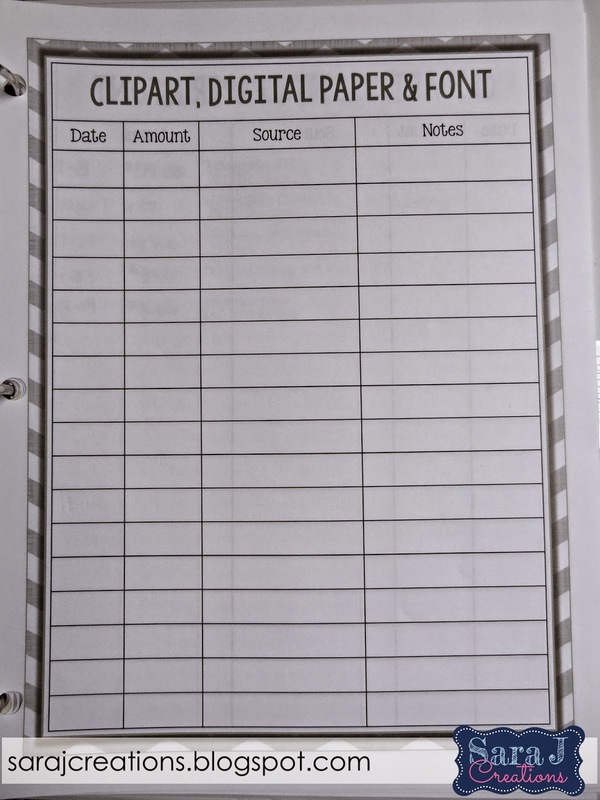 Plus, I still have unused pages from my Lindsay Perro planner that I never used. What to do...What to do? I decided to be economical and use what I already have and then create what else I needed. Let me show you first what I've been using and show you what I loved and what I needed to change. This is the cover of my binder (though the colors are off in this picture.) 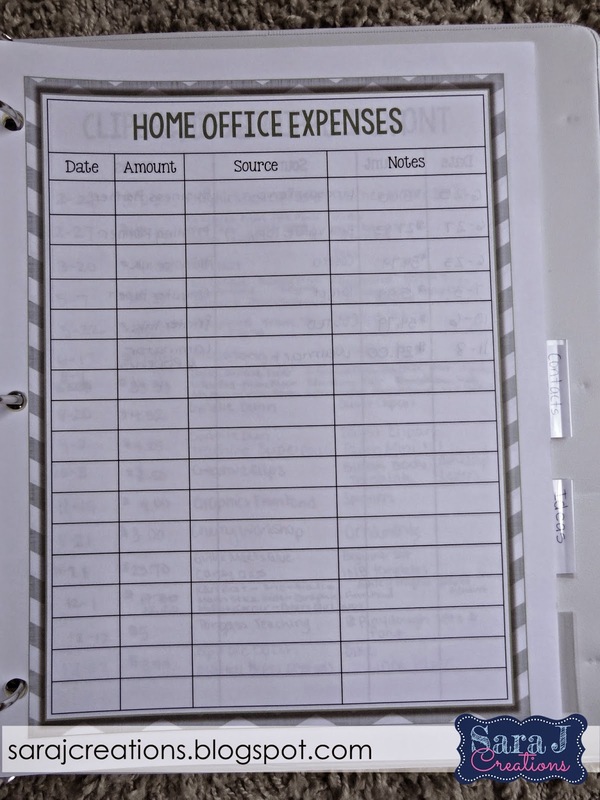 I decided to print it and store it in a binder instead of binding the edges so I'd have a hard surface to write on when working on the couch. It is nice to have pockets in the binder because I can store business cards, receipts, papers I'm currently using for product creations, etc. I like the cover but Lindsay created it with what I had at the time - no blog, no logo, no color scheme. At this point I was considering a blog but hadn't started it. There was a layout like this for every week. Super awesome. Except that I stopped using it. Some weeks I would write products I was working on or blog posts that were scheduled. 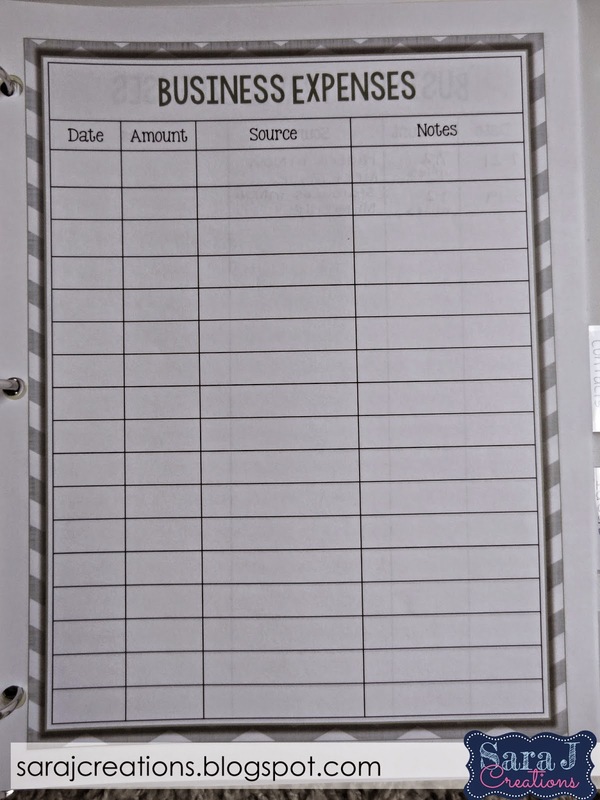 But as the weeks went by, most of the page was left blank each week. Because I hadn't started Twitter or Google + when she created this, there were no accountability boxes for those. I ended up just using the weekly totals to keep track of followers, sales, products sold, etc. I've loved this part of it. It is fun to flip back each week and do a quick compare. I knew I wanted to keep this somehow. Next up, financial record organization. Then I started creating. I'm hoping these will be helpful to me this year and fill the gaps for areas of organization I was lacking. First up, a monthly calendar. I was going to create one and then found THIS freebie on TpT. No need to reinvent the wheel. I knew I wanted a two page month at a glance spread. Lindsay included this in her version but between the full month and the weekly pages, it was too much. 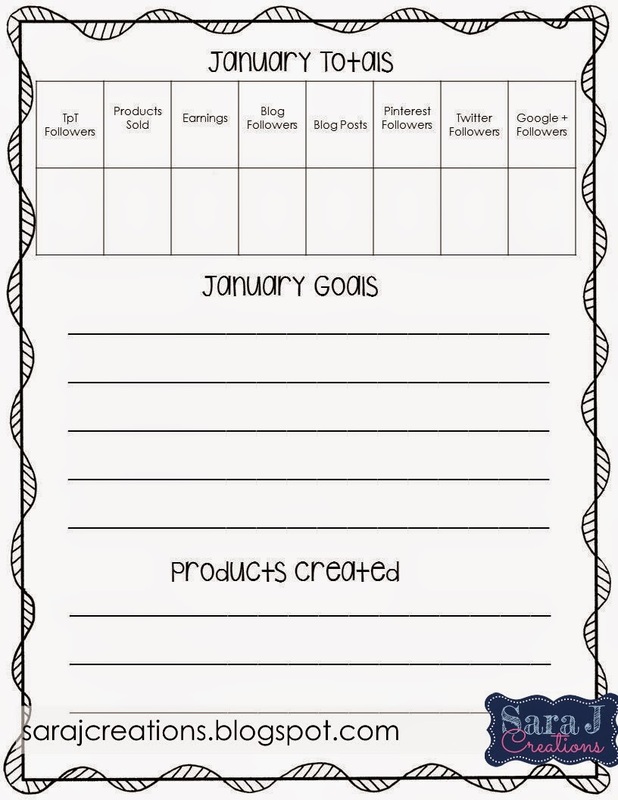 I'm thinking that with this monthly calendar, I can write titles of blog posts on the days they are scheduled, write down linky parties I'm participating in, write when new products are uploaded and more. I'm also debating using letter abbreviations (G, T, B, P for Google, Twitter, Blog, and Pinterest) to remind me what type of social media I used that day. 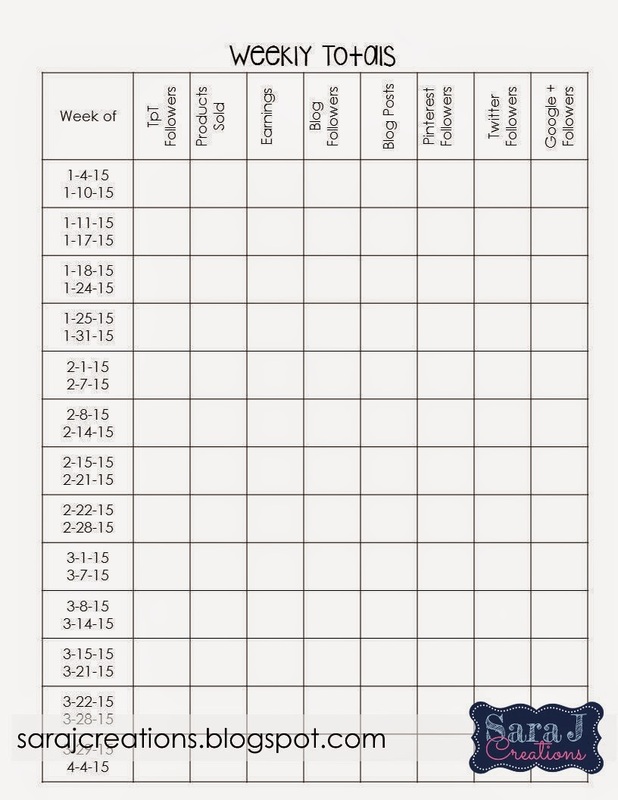 This was something I wasn't great about with the weekly pages last year but I'm hoping if I have it on a monthly calendar, it will make it easier at a glance to see where I need to focus on and how long it has been since I've checked in on various websites. The organizer in me is even seeing each letter written or highlighted with a different color but will see if I can keep up with that. Next, I knew I wanted a weekly totals chart. I liked being able to keep track of followers, amount of blog posts, and earnings each week. I think it will be even easier if they are all on one sheet (or 4 total for the year.) Easier to compare and see trends. I went through and typed in the dates so I didn't have to look them up or write them in each week. I did Sunday to Saturday since that's the way I was already used to from my old binder. 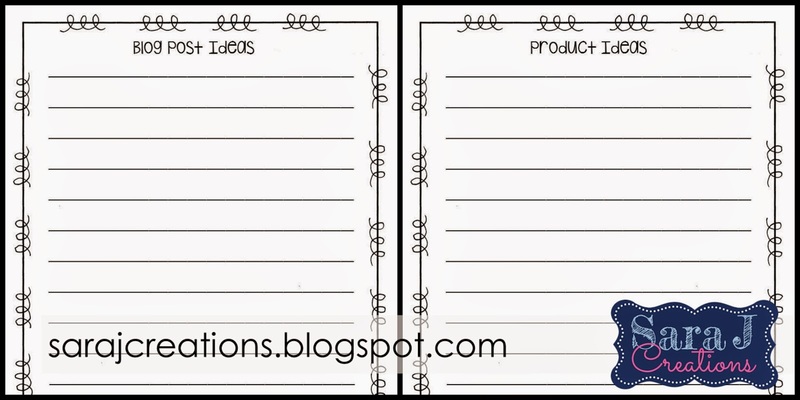 I also created a place to keep track of blog post ideas and product ideas. I do keep a composition notebook with all of my ideas in it but I wanted to have a spot to keep it with my other business info in neat lists. So I thought I was done. I almost started replacing the old pages in my binder. But I stopped myself and said - nope, not until 2015 once I've finished out the year in my old binder. And then I realized I needed a new cover. I used backgrounds, clipart and fonts that I already had that matched my logo. It's just so much more me, don't you think? 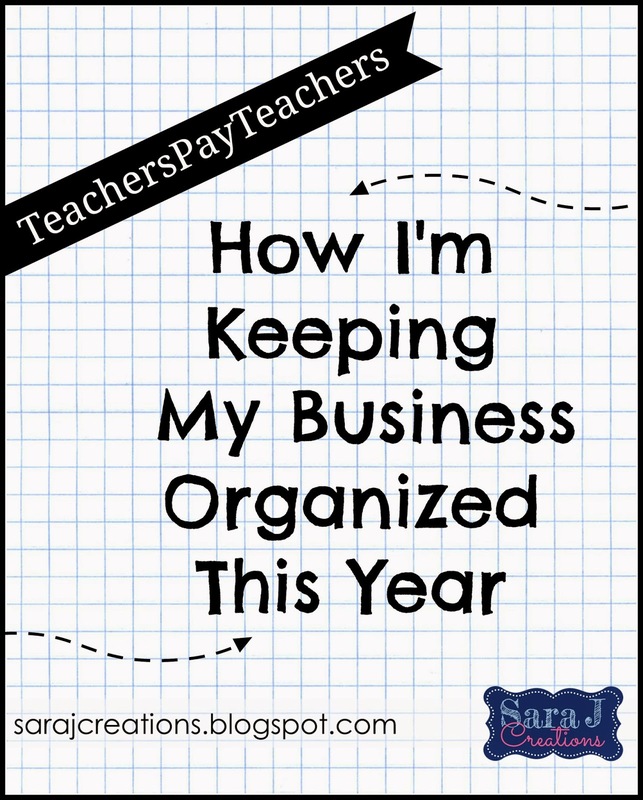 That is how I'm planning to keep my business organized this year. What are your plans? What have you found that works for you? Tried anything you hated? I'd love to hear and improve upon my system. Sara, I love this post so much! 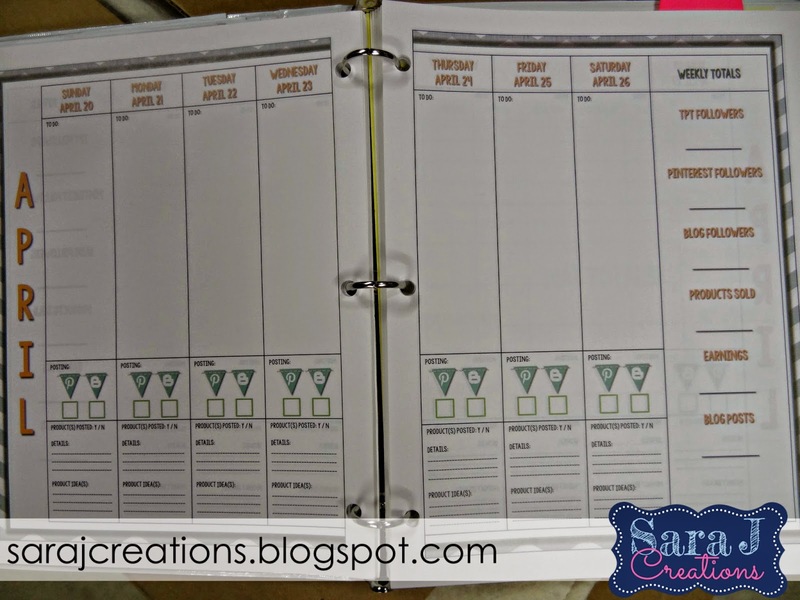 I particularly loved the photo of the page that had weekly goals on it...I have been wanting to keep track of this kind of data, and your post was just the push I needed! One of the things that caused me problems in 2014 was trying to keep several different calendars/notebooks, and so instead of creating a new page or something for a binder, I just made some labels to stick into my Erin Condren planner on the monthly calendar pages...I will keep track of all the follower/posting data by month. I'm super excited to give this a try. Thanks for the inspiration!!! (and I'll email the labels to anyone who wants them, email me at thirdinthird@gmail.com) Happy New Year, and good luck! Thank you! I'm glad you liked it and it got you thinking. I'm learning it is all trial and error until you figure out what works for you...but it helps to see how others keep track of things. Before I bought the Lindsay Perro planner there were items I never even thought to keep track of. Happy New Year! Thanks for stopping by. I hope this helped. Yes, I want cute and colorful so bad but I know I don't NEED it when I'm the only one who looks at it. Good luck and Happy New Year!